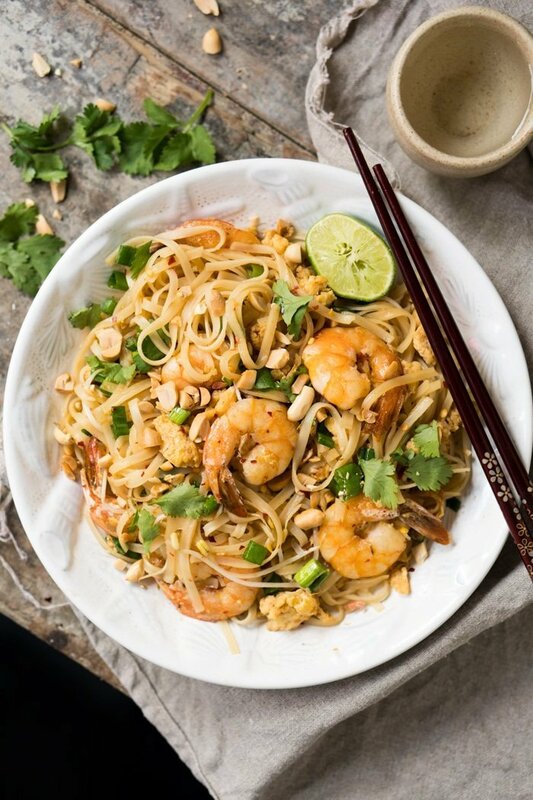 Pad Thai needs no introduction. This much loved noodle, a staple of street Thai cuisine, has gained worldwide love; conquering taste bud after taste bud with it’s incomparable burst of flavors. But in case you didn’t know, it’s also one of the easiest and quickest dishes you can possibly whip up! 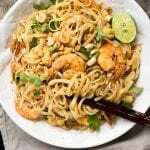 Traditionally made with rice noodles, this keto pad Thai uses shirataki instead. Making an entire bowl just 2g net carbs (!!). Plus, you can whip it up in just 15 minutes. So it’s definitely a permanent weeknight staple over here chez gnom-gnom! Shirataki noodles, composed mostly of water and konjac yam (a water-soluble dietary fiber), are a popular ingredient in Japanese cuisine. They also go by other names: konjac noodles (from the plant they originate), miracle noodles (because of the most popular brand) or konnyaku noodles. What has them trending, however, is that they’re effectively zero calories and carbs. What do they taste like? Shirataki noodles are actually taste-less and will take on the flavors of the dish. Texture-wise is where they vary, as they are more rubbery than your traditional noodles. And tbh, we’re not fans of using them outside the realms of Asian cuisine. But given that the rice noodles used in pad Thai are also on the chewy-side, shirataki noodles do work quite well here. And in our book, definitely worth a try. Plus, they’ve become so popular that you can now find them in different shapes and sizes. Think fettucini (i.e. pad thai), angel hair… and even ‘rice’. Just be sure to prepare them properly. So in order to get them ready, we think best to follow manufacturer’s instructions (albeit rinse for a little longer until the konjac plant aroma goes away). So it’s easy peasy: drain the noodles, rinse well in cold water, place in boiling water for two minutes, then dry the noodles in a non-oiled pan over medium heat. We think best to follow manufacturer’s instructions (albeit rinse for a little longer until the konjac plant aroma goes away). So it’s easy peasy: drain the noodles, rinse well in cold water, place in boiling water for two minutes, then dry the noodles in a non-oiled pan over medium heat. Set aside. Whisk together thoroughly in a small bowl fish sauce, coconut aminos, sweetener and red pepper flakes or cayenne. Add lime juice to taste, starting at 2 tablespoons. Heat up oil in a skillet or pan over medium heat. Add in garlic and sautée briefly until it just starts to brown. Add in shrimp and cook for 2-5 minutes on each side (depending on their size), until just cooked through. Pile the shrimp on the edge of the pan. Pour in the lightly beaten eggs and continue to cook, stirring them to scramble, until solid but still moist and tender. Pour in the prepared sauce and mix briefly until the shrimp and scrambled eggs are evenly coated. Add in prepared noodles, tossing to coat in the sauce. Add soy sprouts and continue to cook for 2-3 minutes. 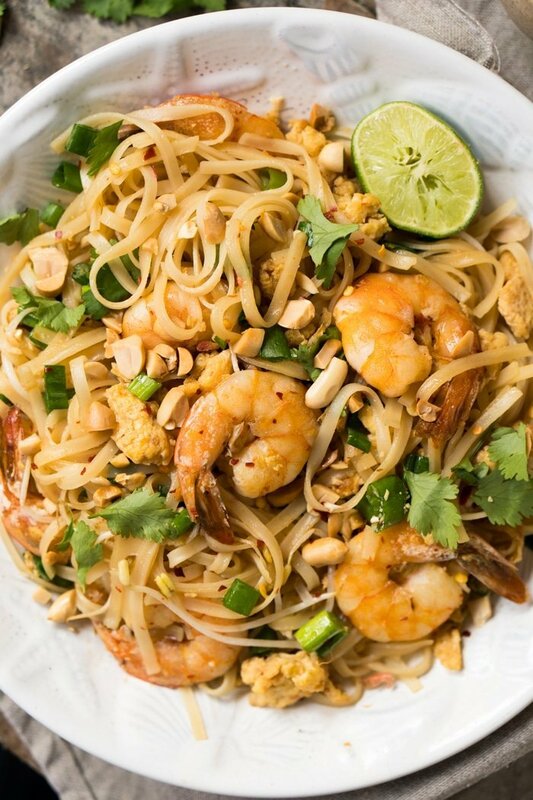 Garnish with green onions, cilantro and peanuts. Serve immediately with fresh lime. *Or use whatever shape of shirataki noodles you have around. 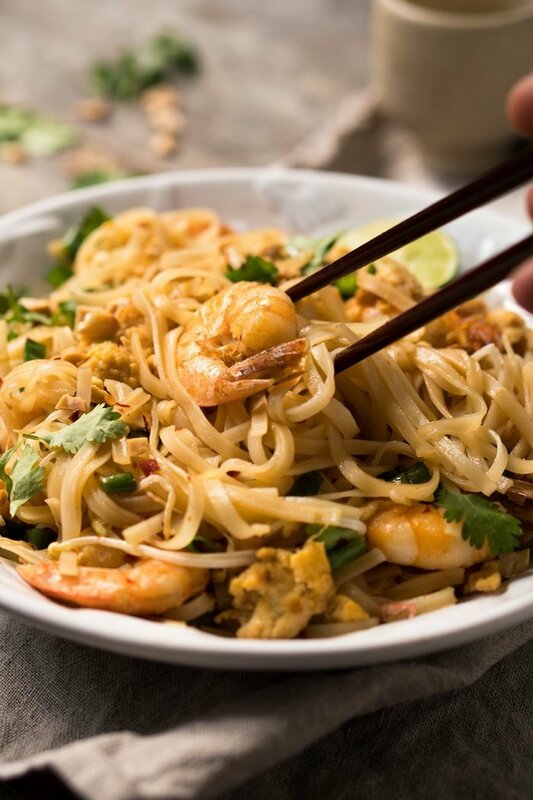 ** Pad Thai is traditionally made with brown sugar, and so adding a touch of molasses to your sweetener will do just that (with minimal carb impact). Having said that, you can always skip it or use a brown sugar substitute such as Sukrin Gold. *** If paleo, substitute the toasted peanuts for almonds. Please note that nutrition facts were estimated using shrimp and peanuts. I love this recipe and we have been making it every other week. But I had a question… I decided to put this recipe on carb manager (app) since my husband and I both started trying to keep better track of our carb intake. We usually make it with chicken, and we don’t even use 200g as it just seems like so much chicken when we first cooked, so we reduced to 180g, and we do add a teaspoon of sriracha, which is another carb and we’re aware. Also, we don’t like bean sprouts, so we skipped that. These are really the only changes we made to the recipe and for the most part, our ingredients are the same brand. However, we’re getting twice as many net carbs from the app. I tried adding it all up myself, and the same thing. I know not to count carbs from the sweetener, so where do you think I’m getting things wrong? I’m sorry to bother you with that and for the most part, I really don’t care, but my husband will eat 2 servings of this easily. Thank you for any input. Ooooh nice one Lara! I’ve made them with zoodles too, but love the idea of coleslaw! Thanks for the tip will love to try it! xo! This was terrific! I’m sure we’ll have it again and again. Thanks very much! My store has coconut aminos in the gluten free section. They come in a bottle, are liquid, and looks like soy sauce. You can order coconut aminos on line at Vitacost…great price and lots to choose from ~ 49$ gets free shipping! How much sukrin gold if I use as a replacement for the molasses? Thanks!! Can I just say, you’re my hero! 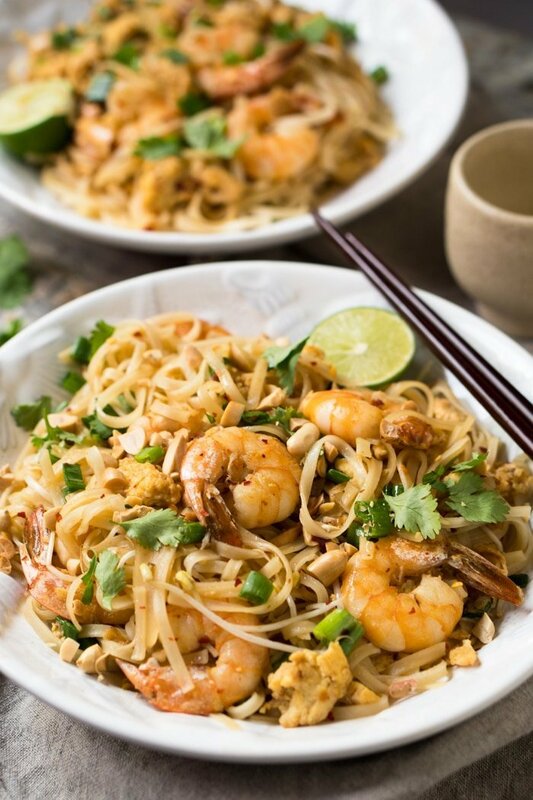 I adore Pad Thai and ever since going Keto, I’ve been craving it. This is by far the best Keto meal I’ve made. In my opinion, this is better than the original carb laden version. Amazing. Thank you!! Made this last night- we LOVED it! Made this tonight and followed the recipe exactly. My husband who refuses to eat “keto” ate this and his comment was, “I’m impressed.” High praise, indeed! Actually this is very easy to make and the taste is excellent. Thanks and I will be coming back to try more of your recipes. Wish there was a way to post the pic I took — it really came out wonderfully. Loving your site! Such awesome recipes:) excited to work with Shirataki noodles. What would you say if I prepared this for a couple of meals and ate it cold as well? Would it work you think? The ingredients says coconut aminos but the link goes to regular Braggs aminos. Do they need to be coconut or not? Thanks! OMG.. as an Aussie girl who grew up in Asia slurpie noodle dishes are a constant cracking on low Carb. I know I used to eat these noodles as a kid and loved them but since they’ve been in the news have always been weary of cooking them myself. Made this as per you recipe tonight, chucked in broccoli & asparagus as it was wilting in the fridge… AMAZING! Thank you for opening up a whole new world. Wow! 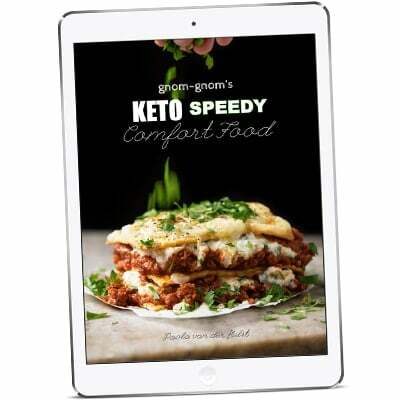 I’ve just recently delved into the world of low carb/Keto recipes and your blog is so inspiring. I truly appreciate your creativity. This recipe is amazing!! So, so satisfying. I doubled the recipe for 3 people, and every last bit was devoured. I also added some crispy tofu in addition to about 8 ounces of shrimp. Thanks to your blog and many others that I continue to discover, I feel like a whole universe of recipes (edible possibilities!) has opened up to me and I don’t feel restricted at all! I gotta admit bacon and eggs every day was wearing me down. Keep it up! I can’t wait to eat more! Did you use Bragg Liquid aminos or Braggs liquid coconut aminos. Only asking cause the link takes me to just the regular Braggs liquid aminos. Can’t wait to try the recipe! The noodles shown in your photo here are definitely NOT shirataki noodles, they are clear, not opaque, as shown here, a little misleading I think. Mine are opaque. Rice noodles are sheer! This recipe is amazing! My boyfriend and I loved it so much we were fighting over the leftovers. I didn’t use the molasses but it came out fine. I’ll definitely be saving this recipe for future use. 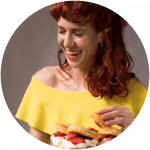 I don’t think you would quite get the taste with stevia tbh Amanda… but if you aren’t doing keto could you do something like coconut sugar or honey? xo! Hi. Quick question. When you do add the xylitol in the recipe? It doesn’t say. I just made it using Monk Fruit Sweetner (which from what i read online is keto friendly & better than stevia) and it the recipe tastes great! I also left out the molasses. I would imagine that it depends on the taste profile you are after, as this is not a baked dish. This. Was. Amazing! 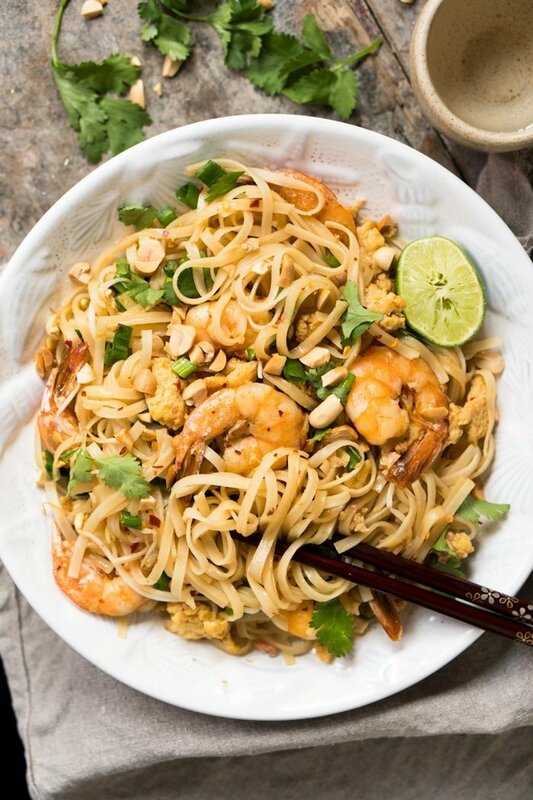 We are still new-ish to Keto and I have been dying for Pad Thai. Hit the nail on the head. Our first time trying Miracle Noodles, couldn’t tell a difference. Only subbed the sweetener with truvia (2tsp), only 1 tbsp of the peanuts and cooked the eggs in a separate.